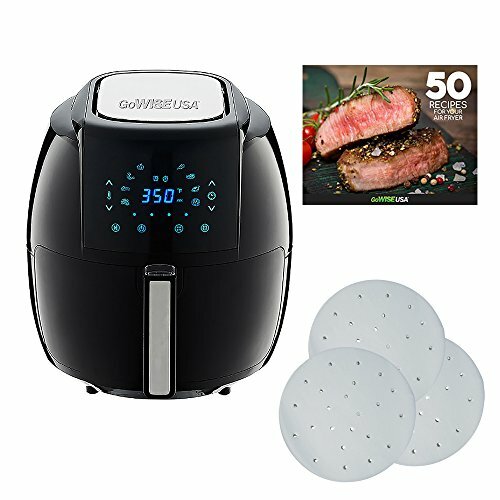 What Size Air Fryer for a Family? You want a healthier cooking option for your small family, but you’re not sure what size air fryer you need. For most small families, a 5qt air fryer is the better choice. Read on to learn more about why you should opt for a 5qt fryer, the different options available from the best air fryers and our top recommendation for your family. The primary options for air fryers are 3qt and 5qt. You might think that getting a smaller air fryer is wise because you don’t need as much food and it takes up less counter space. The fact is, bigger is always better. Bigger air fryers cook food faster. Overcrowding of food prevents airflow, which slows down cooking time. In addition, food that is overcrowded may not become crisp. Instead, it can emerge from your air fryer soggy and disappointing. A 5qt air fryer cooks almost double the amount of food as a 3qt. The larger fryer can cook an entire chicken, cook multiple foods at once and leave room for leftovers. Lastly, a 5qt air fryer is simply a better value. Of course, there are times when a 3qt fryer may be more suitable. If you are cooking for only one or two people, a 3qt fryer could be ideal. This is especially true if you don’t want leftovers and are not planning on hosting additional people for future meals. A 3qt air fryer is also better when counter space is limited. Those on a budget may consider the 3qt air fryer as they tend to be less expensive than their larger counterparts. The NuWave Digital Air Fryer is an ideal fryer for small families who like having extra food for guests or leftover. The six-quart size of this fryer lets you make as much or as little food as you like. It also has a sleek design, which fits with any decor. The square shape of this fryer fits easily on your counter, taking less space than even smaller fryers that have a rounded base. The digital display is easy to use and easy to read. The removable basket has a non-stick surface that makes cleanup truly simple. 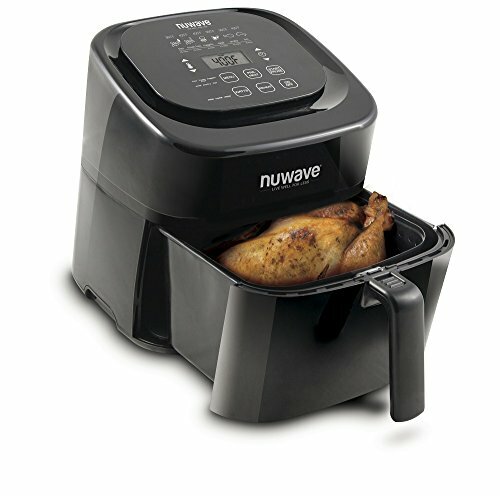 You only need to lightly scrub and rinse before you are ready to use your NuWave Digital Air Fryer again. 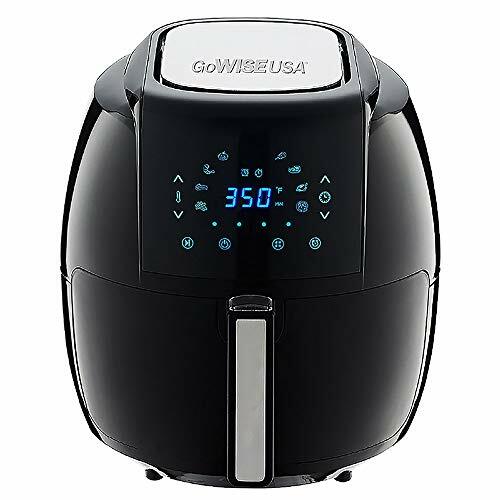 The GoWise USA air fryer is our favorite for many reasons. The 5.8 quart basket lets you cook as much food as you like without taking over your counter space. It comes with preset programs that let you quickly and easily cook fries, pork, fish, pizza and even cake with just the push of a button. The GoWise is among the easiest fryers to clean, thanks to its nonstick basket. It also has a unique cool touch handle. You won't burn yourself when you are removing food. Among the favorite features of this air fryer is the accompanying recipe book. 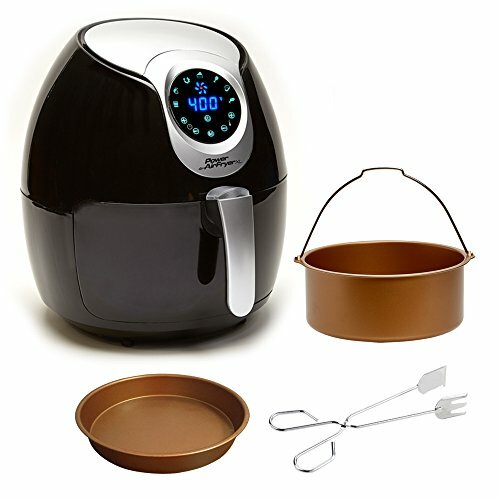 Specifically designed for this air fryer, you will be given access to 50 new recipes that will delight your family. This appliance is also low cost. You get everything you desire from an expensive air fryer without the high price tag. 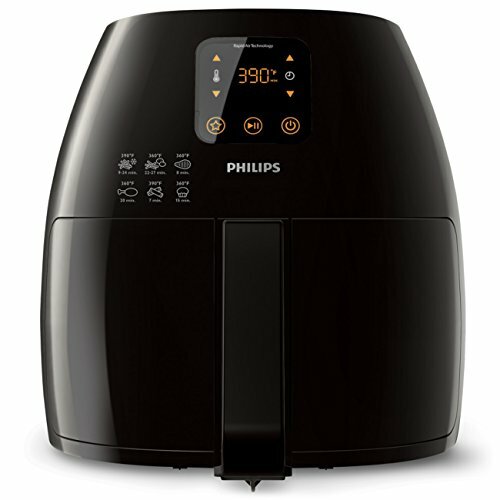 If you are looking for the best quality air fryer, look no further than the Philips XL Airfryer. Billed as The Original Airfryer, the Philips XL arguably put air frying on the map. The higher price you might pay for this air fryer is well worth it. This model is speedy.You can cook an entire meal in the same amount of time you might spend going to a fast-food restaurant. It comes with a digital display that is simple to use. It also remembers your favorite recipes for even faster cooking. Unlike many air fryers, the basket in this model is dishwasher safe. You don't have to worry about any messy cleanup at any time. This appliance is approved by Gordon Ramsay, who also provides recipes for making delicious and nutritious meals. 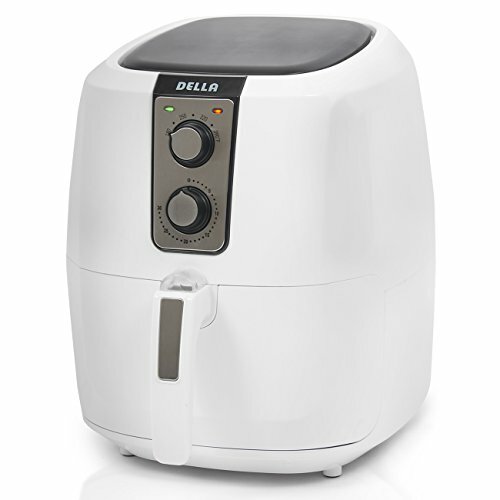 This Della air fryer is an attractive option for the style-conscious cook. Available in vibrant red or sleek white, this appliance adds a touch of decor along with its excellent air frying abilities. It is easy to use, easy to clean and can cook a multitude of foods. The Della air fryer requires little oil in order to cook from french fries to chicken breasts. This air fryer has a 30 minute timer that automatically switches to standby mode, saving you energy and time while also keeping your freshly fried foods piping hot. With no digital mode display, the Della air fryer is a good option for those who do not have the time or desire to devote to learning complex technology. You have undoubtedly seen this air fryer before. The Power Air Fryer XL is one of the most popular air fryers on the market. As seen on TV, this air fryer can fry or cook almost anything with little to no oil. It has a variable temperature control of up to 400 degrees. The Power Air Fryer comes standard with a three piece kit that offers even more versatility. It has a baking insert for making everything from bread to juicy meat. It also comes with a pizza pan. You can make your own pizzas at home that taste like they came fresh from delivery. The Power Air Fryer also has an easy to use digital display with pre-programmed setting. You are well on your way to healthy fried food with just the push of a button. An air fryer is an excellent way to offer delicious food to your family without hampering their health. These appliances let you serve restaurant-caliber food in minutes with very little cleanup. Air fryers also make a great gift for newlyweds, housewarming, retirements and more. This is one purchase you will never regret. We recommend purchasing a 5qt air fryer even if your family is on the small side. The larger air fryer allows you to cook food more evenly, cook larger quantities when you need them and have more versatility than smaller air fryers.